St Matthew's is a large sought-after venue for music-making and the performing arts, with a distinguished heritage of artistic excellence and patronage. 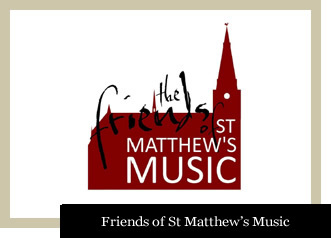 The Friends of St Matthew's Music is an association of people who wish to help maintain and enhance music-making here for present and future generations as well as to enjoy one another's company through a programme of social and cultural activities. work of the Choir and to music events held at St Matthew's both choral and instrumental, as well as contributing to provisions relating to the music. The Friends also contribute positively to scholarships and educational courses in addition to the Choir's cathedral visits and social outings. In order for the music at St Matthew's to continue to thrive and to ensure the future security of the Choir and tradition which has been built up over a period of more than one hundred years we need your support. Support of the music through the Friends is given by members in regular payment of subscriptions and, for some, by joining in the life and worship of the Church community. While many members live locally there are others further afield who simply enjoy receiving information about the music of the Church, its mission, development and role within the community. If you are interested in joining the Friends of St Matthew's Music and supporting our cause, please contact the Director of Music. Alternatively, you can signup or renew your membership via the FSMM Online Payment page. Subscriptions are £3 per month, £9 per quarter or £36 per year and are payable by cash, cheque or banker’s order.